As I promised you, I will share another grunge text effect photoshop action today. You will find more destroyed fonts in result with the same kind of random rustic details at the text background which I could not control the size to display. For a better text effect, I think you would still need to do the retouch manually and I will show you how. Download the Graphic Identity - text grunge 02.ATN (2Kb) inside a WinRAR archive file. Jordan McClements of IrishViews.com with 70,000 visitors per month have started a photo contest this week. It’s an interesting contest to join and the submission entry is labeled “Photos on a Theme”. If you have at least 6 really good photos on a specific theme, which you think would look good as a Desktop Background / PC Wallpaper, and then you have a chance to submit them right away. “Scotland”, “London”, “Fishing”, “Snow, “Glaciers”, “Forests”, “Rivers”, “Boats” etc. THE PHOTOS MUST BE YOURS! NO recognisable faces of people. You must have at least 6 related photos on a theme. Email all photos on a specific theme as one email to jmcwd.com@gmail.com with the “theme” in the “subject” line. This was my weekend experiment, trying to capture best photoshop action series of grunge text effects. As an experimental work, in the finished text effect there are random rustic details at the text background which I could not control the size to display. You would still need to do the retouch manually and I will show you how. Download the Graphic Identity - text grunge 01.ATN (2Kb) inside a WinRAR archive file. The first time I know about Viral Linking after I read Rocky John Tayaban post in his blog: Blogging Mix. Replace the link to which the first letter of your URL starts with. (e.g. "G" for Graphic Identity) You may choose to use anchor text to link to your blog and replace the link to which the first letter of your anchor text starts. (e.g. "S" Search Engine Optimization. Please limit your anchor texts to 4 words to make it more manageable. Increase your Technorati Ranking and Google Page Rank. Since this linking activity is viral, expect that you'll get results fast. You could probably get more friends, fans or readers. Increase the number of traffic to your blog. Understanding CSS may take times for some of people. Especially if it is dealing with CSS tab buttons for the website. CSS Tab Designer will make that easy for you. Because you don’t need to be a master of CSS script to implement amazing horizontal menus (tabs) or vertical menus design in your website. I have known this tool since two years back and still rely on it quite sometimes. The tabs in my Graphic Identity blog are using Centered Sliding Doors tab style. I modified their grey background into white, to blend with my main column background color. There are 11 designers who have contributed their CSS tab design in this software. All tabs (60+ different designs/colors supported) have been designed beautifully and easy to modify using CSS Tab Designer. The code generated for these tabs is strict xhtml compliant code. How to create tabs in CSS Tab Designer? 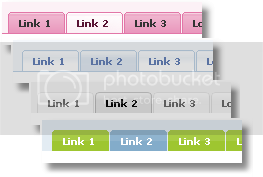 You will see three columns in CSS Tab Designer 2.0 interface. It's a new Blog Community, where you can build interactivity by joining certain Groups or Forum. Blogsrecord is also an interesting blog directory which designed to find information on anything blog related. There are a lot of benefits you can gain by interacting with others in a forum. Why you should join to Blogsrecord? Chris, our friendly admin, guarantees you to have all your blogs would be easy to read in Blogsrecord user list. 5 (five) Latest Users always shown on BlogsRecord home page, in other words: your profile and also your blog visibility to others will increase as much as your frequent visit to the Blogsrecord.com. 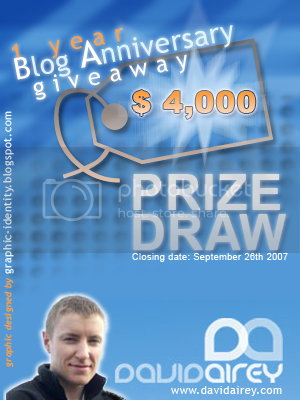 David Airey, a graphic designer from Northern Ireland, is holding an anniversary prize giveaway. Started on September 1st, 2007, there’s more than $4,000 worth in free prizes! :) You can achieve the maximum number of draw entries and chances to win are open wide. Talking about Blog Designing? Check out the list of Design and Blog Review Prizes from Top Designer and Excellent Blog Reviewer Sponsors. They will contribute their time and profesional skills to design and to review the lucky winner’s Blog. One year’s hosting and blog setup from John Boardley of I Love Typography. Website critique from Randa Clay of Randa Clay Design. Logo / blog header design from Jonathan-C. Phillips of Smart Wealthy Rich. Those are just some mouth watering prizes! I haven’t mentioned the SEO free consultation and lots of Bonus prizes. I hope that you won’t leave these prizes on the table after reading my blog contest postie!!! Feel free to grab this graphic below to be put on your own blog and start your entry right away. Mark the date and hurry up because all entries must be received by David on Wednesday, September 26th 2007. Find out how to enter by reading the details on David’s graphic design blog. I’m coming back with another font review, and don’t be so surprised since this post is closely related to my previous font review: 6 Free Graffiti, Grunge, and Destroyed Fonts. Junko’s Typewriter reminds me to an old typewriter, because the baseline of this font is not inline or unordered. Not much textures, but pretty solid in each character. Classic shape of terminals and serifs definitely make them different than any other typewriter fonts. I already wrote a tutorial about how to create Snow Text Effect using Photoshop back then, and today I want to share the Snow Text Effect in Photoshop Action with you. Download the Snow Text Effect.ATN (9Kb) inside a WinRAR archive file.